This is first post of the year 2010, I wish all my blog readers a very happy and prospurous year. Today I am sharing Excel Date Picker Utility with you. Following picture will demonstrate some to the capabilities of this utility. 1. In case you select a cell with date, or select any cell around the cell with a date. It will show floating button on the left side of the cell. If you click on the floating button it will show popup calender. 2. In case the cell already has a date , the calendar will show same date by default, else it will show current date. 3. You can jump the months by click on the month value on the popup calendar. 4. Click on the year will show spin buttons next to it and you can change year easily with spin buttons. 6. You can also use Ctrl+Shift+d to show popup calender on your screen. 7. In case you get pop up calander and you do not want to click any date, just press Esc to close the pou up calendar. 1. Many people end up entering date in text format as some time it is difficult to enter the date in correct computer readable format. With the popup calander, system takes care of the proper date entry. 2. Some times you have to get data from other users and you want them to enter dates in proper format so that rest of the worksheet can use those date inputs. With this utility you can be assured about this issue. You may figure out many more usage based on your needs. The VBA code for Excel date Picker is available in the downloadable file. You can further modify the code as per your needs. 1. Download file and save it as Excel Addin on your machine. 2. You will need to copy this code to worksheet module of your workbook. You will need to add this code to show the Floating button. This code will creat the button in case it does not exist on it. All other features like cell menu on right click and popup calender on Ctrl+Shift+d will be available in case you do not add this code by saving download able file as Excel Addin on your machine. I am suggesting this because I still need to learn how to trigger worksheet selection change event with a vba code in addin. However this will not work on the files you send to other users. In that case you need to builtin the entire utility into the file you are sending out. Following steps will help you to do this. .Caption = "Show Date Picker"
3. Move form named calander from the downloadable file to your file. With these steps you can send the file to other users and it will work in similar way as it works on your machine. Wish you a very happy and prosperous new year. I am sure that you will check comments on my post. I need some help from you. I need to learn class module prgramming. Can you suggest me some web pages or downloadable material for my learing. Happy New Year to you too. Your posts are informative and sharing the codes helps budding code writers. As my Dad says "Knowledge is multiplied when Divided amongst others". Thanks for giving freely. I use some of your code. I need to apply the following code to a selected cell. I DO NOT know anything about coding in XL, but can work with Access VBA. I hope this should resolve your question. Let me know in case you have any further question. How would I write code this as a Function ? Sorry but as I mentioned earlier Excel VBA is not my strength. My intention is to call a function with this formatting. Beware that the final value will be a string and can not be used for calculation further. Thanks. I am begining to learn this as Excel is more widely used at the current work place. Your code works, but the value of 123456789 gets truncated to Dhs. 12,345.68 WHY ? And Yes, the converted value will be a String. OK. I edited the S / 100 to S (as in your code) and it was fine. I am glad that you figured it out and made changes. Now your question by it did is in your first post. "(say 123456789) into Dhs. 1,234,567.89"
check out the format you have used for final output. Thanks Yogesh for the pointer. I figured it out. This Calender control works fine on my machine however it prompts an error "Could not load library..." on others machine with same Office version. Can you please let me know the reason behind this? The calander control is windows functionality. I suggest that you check the windows version on others machine. Code for converting number into figures are for currency only, can we not convert in only numbers i.e. not in currency. Thanks for this calendar picker code Yogesh. I added it to a workbook to be shared with others. Only issue is I don't see the button although it works fine by right clicking and selecting "Show date Picker". I am using Excel 2010 (64 bit) on Windows 7 (64 bit), and I am unable to get the date picker to work. Have you tried getting a date picker to work on 64 bit Excel 2010? Excel Date Picker is not working in office 2007. I would like to limit the selectable dates to 01-01-2011 till 31-12-2011. How do I do that? how are u. i am having may excel files in a folder and each excle contains 3 woorksheets. Help. When I used the popup calendar. The floating button is just white with no icon inside. newby here. Hi Yogesh, I'm trying to convert your vba code in order to make it works on Office 64bit. But I got stuck at UserForm "Sub UserForm_Activate()"
It said do not have method "MonthView1"
I know vba7 has no more MonthView control. Maybe you have some clue ? I too am having problems with MonthView1 being undefined with Office 2007. Can you please help? Can you please describe step by step how to utilize the code for the datepicker. I'm trying to but can't figure it out. I'm not too computer savvy. Thanks! Also I have MS Office Excel 2010. Is this an issue? Could you please tell how this calender utility activates when one select any particular cell?? it works for the most parts, but how come it dose not show floating button when mouse over the selected cell?? This is the best date picker I have seen. Wondering if you could help? I have very limited VBA skills and want to use your date picker function for certain cells throughout a spreadsheet. How do I change thye code such that the date picker pop-up in say cell G4 & L15 as an example? I will be emailing the file to others. Hey Nick have you got the code to set the floating button for pop up calendar to selected range of cells? when I have column were we have written a date like...01-Aug-2011, I need to separate find out the month by using farmula, in other column in text like...Aug..
how to implement this date picker in a protected sheet? Where do I have to insert Sheet1.Unprotect "password" line? Its a great contrib anyway. Thanks! how can i activate the flowting calendar button on specific cells like you did in the "date picker" example excel sheet? I'm a bit of a simpleton when it comes to these things but I tried to setup your date picker and am doing something wrong. It looks like from your description on how to use this all I have to do is place the downloaded file into the XLSTART folder where Excel saves recorded macros. I did that but now when I open one of my Excel files your file also gets opened and poking the Show Date Picker cell menu item yields a beep and locks until I poke ESC. I tried saving the file/macros as an XLA file but that didn't help (still two files and beeps). By the way - everything works fine in the date picker.xls sheet. I am having difficulty adding this to my spreadsheet. If possible, could I email my workbook and you add your utility so that it works? I would appreciate any help! sir, i m using drop down & vlookup function i creat a list of drop down. but when i use drop down it is working in sorting order. not in regular order. Has anyone figured out how to get the small button to appear next to the cell when using the date picker? I can use it when right clicking and selecting date picker from the menu, but can't seem to get the small button to appear. I know I copied the code to a "T". Thanks. I've had the same problem with the small floating button not popping up next to the cell and I believe I've solved the problem. After you finish copying the code using the steps mentioned above, you notice that there's a little square "command button" that pops up where it's not supposed to be. It's actually two command buttons overlapping each other. They do nothing. One of them is supposed to be your floating button. It doesn't matter which one, you just have to name it or position it right. Hope this works for everyone! I need some quick advice. I used the SEP Date Control in Excel 2010 to create a date picker and would like to copy and paste the value of the date in a master spreadsheet. Is this possible? I have try with your program and it works great, but I'm wondering if there is a way that a I can create a calendar on an UserForm and when I select a Date, this date will be written on a LisBox on an UserForm, do you kno how to do that?? "Could not load a object because it is not available on this machine"
whith "wHandle" highlighted in blue.... Help me plssssssssss!!! Do you need any .ocx files for this to work? I get it working on some machines, others not. 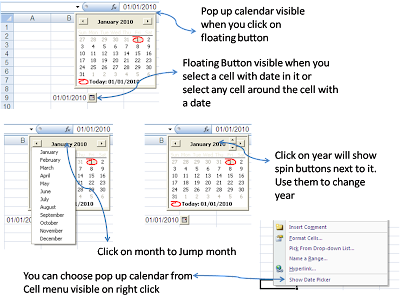 Hi Yogesh - How can i get a pop up calendar in a Userform text box.? Let me know if you have a solution. Today is my second day on your blogsite - i would like to congratulate you for putting together such good material on VB. Hoping to learn a lot of things from you. I have used Date Picker placed at E2 column and update Excel Column as Range("A2").Value=DatePicker.Value and called Sp from macro with Range("A2").Value as parameter. The problem is when i deselect designeer mode, one more datepicker is visible in extreame left of the excel and DatePicker at E2 become function less, also when i select Desginer Mode at Developer Tab, Extreame left DatePicker disappear. Please suggest, i just want to use and display DatePicker at E2 location only. This is how i got it to work in office 2010. I simply added checks in the selectionchange routine of a page to look at the cells I had dates in. Hope this helps everyone. If there is more change needed, please post and I will see what I can do. Can any one help me please i have already searched this a lot and tried all solutions but failed and failed. I want to insert all dates of month in range of specifies cells by referring month and year in another cell. Can u please help on this? ?